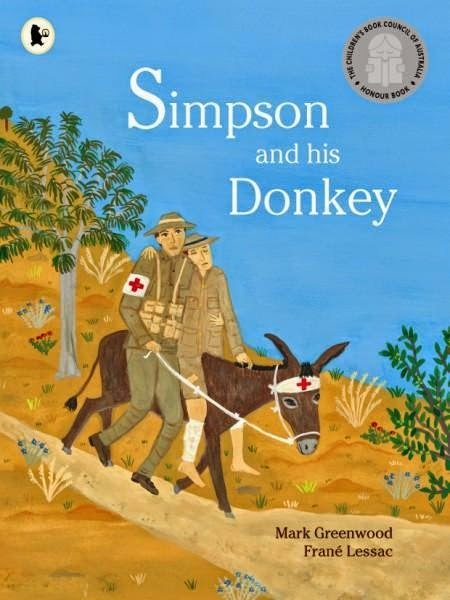 The heroic life and death of Jack Simpson and his donkey is presented again by husband and wife team Mark Greenwood and Frane Lessac. It starts with Jack’s life before he sailed for Australia, then aboard as a stoker. His working history shows us the man he was, and how easy it was for Jack to serve ‘king and country’ when the war broke out. But fear replaced the sense of adventure that many soldiers set out with, when the fighting started on the ‘razorback ridges’. Jack was working tirelessly carrying wounded to the boats to be evacuated, when he came upon a stray donkey which he named Duffy. Thus they became Simpson and his donkey. This immortal story has been brought to life again through Greenwood’s ability to tell a great tale, and make it sound fresh and new. Lessac’s insightful illustrations fit like a glove around Greenwood’s words. Detailed and expressive, each full page illustration gives up all of Simpson’s bravery, determination and courage, as he carries water to thirsty troops, and makes the return journey with a wounded soldier on Duffy’s back. One of them being his childhood friend Billy. It also gives us a clear picture of Gallipoli and the conditions the men experienced there. It’s a salute to this part of Australian history that is in our hearts and memories. Simpson was admired and respected as ‘the bravest of the brave’ due to his humanity. He died the way he lived - always doing what was right, and serving others. He was buried at Hell Spit. We must also reflect as we turn each page of this beautifully illustrated edition with its poetic prose, on all that we are because of Gallipoli.